First day of a new year and I am inspired to get back to this blog. I’m working on lots of different projects and my plans for 2017 and beyond are growing. But I’m excited. This is going to be a great year and I am going to be grateful and celebrate all the blessings that I receive every day. 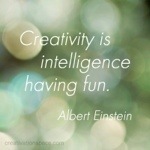 This time of year there are always quotes floating around to help those who look for them find inspiration. The image above has stuck with me the last few days so I’m taking it as a mantra and meditating on it. At least for now. In my efforts to be fierce and brave I’ve come up with a word of the day plan. I’m not sure if it will continue to be daily words or if some times the words will linger. Who can say what the year will bring? 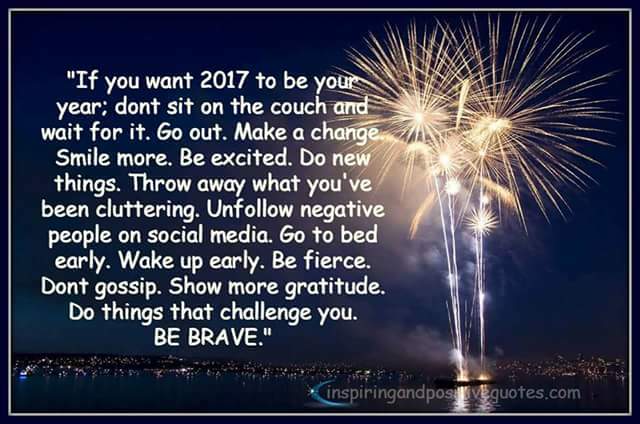 I don’t remember where I first found this acronym but it is appropriate for today and the fresh beginnings, adventures, and opportunities of 2017. So what does W.O.O.T. mean? I am willing to make the choices and changes that will take me closer to my goals. I remain optimistic that my dreams are attainable. I believe in myself and am objective, realistic, and inspired to make 2017 a phenomenal year. Finally, I have the tenacity to keep moving forward. I may only take tippy toe baby steps but I will continue on the path to reach my goals and live my dreams. I hope you will join me on this journey around the sun. And I hope that all your hopes and dreams come true this year as well. I found so much inspiration within this post. Great ideas to keep me motivated and words of wisdom for when things don’t go quite like I imagined they would. Today is a new day. Cliché I know but it’s how I feel. I’m taking control of my life, my emotions, and my journey. I have lived my life making decisions based on what I thought others wanted. Sometimes based on what I wanted and sometimes against my better judgment. Those decisions have made me the woman I am today and I’m grateful for them. Not to say that I don’t sometimes wonder what my life would have been if I’d chosen differently…but I can’t go back. So no regrets and no pity parties, just open eyes, dreams to chase, and a positive attitude. 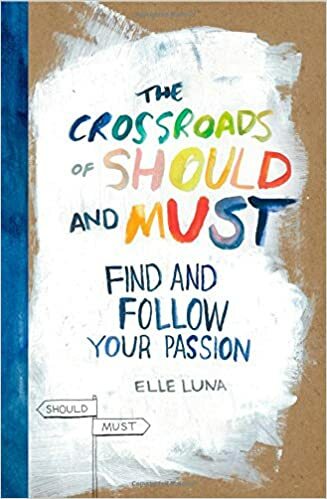 I just recently finished reading a fabulous book by Elle Luna called The Crossroads of Should and Must . This book inspired to revisit my blog, which had been sadly abandoned for more than 2 years. I had reached a point where I didn’t believe that I had anything to say. Nothing to share. The creative well was dry and I had no idea how to refill it. I wish I say that everything was better now, but that’s not accurate. Life happens and sometimes it’s tragic. When those tragedies strike we can either hide and wish that it would all go away. Or we can acknowledge how we feel, embrace the suckiness of whatever has occurred and keep moving. I’ve done both and although sometimes it feels like I’m marching in place rather than dancing forward, at least I’m moving. Right? Anyway, back to the book. It’s wonderful! Not only is it a quick read, if you want it to be, but it’s also thought-provoking. By the time I’d finished reading it I had pages of notes and comments written in the margins as well. I highly recommend that if you haven’t had a chance to read book that pick up a copy. The basic idea is that we often do what think we “should” instead of what our heart and soul say we “must”. There are many reasons that we do this and I’m guilty of most of them, but the great thing is, we return to this crossroads many times. Those crossroads brought me back to my blog. I made a different choice when I stood before the sign this time and turned in a new direction. I’m inviting all of you on this journey with me. I don’t know where it will take me. Or what I find there tomorrow but it will be an adventure. I’m hopeful that I will find to make “who I am and what I do” one and the same. If you want more information Elle Luna’s book check out her video. Mom and Dad on their wedding day – 45 years ago! Hard to believe that this is my parents on their wedding day. Of course it’s been 45 years, but they look so young. They have always been, and will remain, an inspiration to me. They made it work – no matter the challenges. And they continue to apply that philosophy to their lives today. I only hope that someday I will be able to look back on my life and feel like I have inspired those I know…like they inspired all of us. It is way too early to be awake but since I’m up anyway I might as well use the time. Lots to do today…endless lists but what else can ya do? 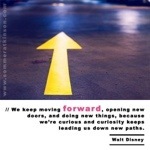 My thought for today is to follow Disney’s advice and find something to engage my curiosity! 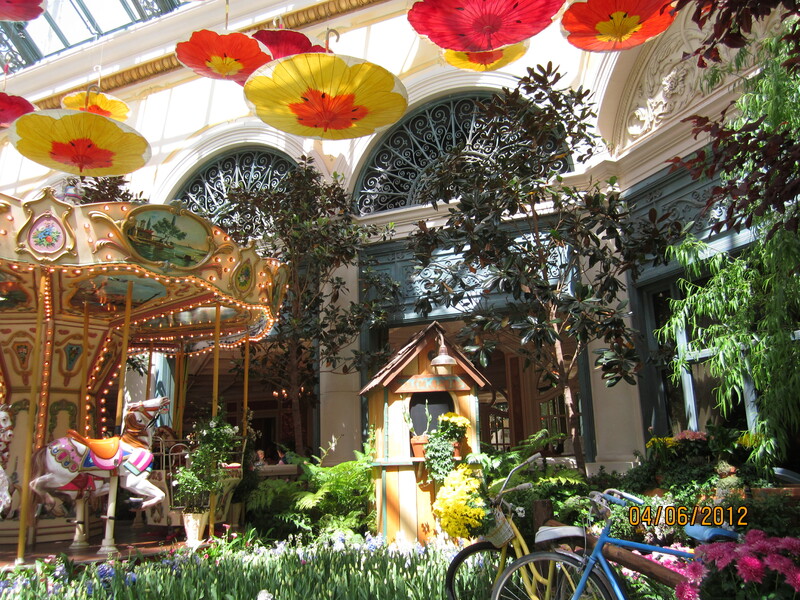 This spring I went to Vegas with some of my favorite people and as we toured the Bellagio Conservatory I snapped this picture. It was all decked out for spring with beautiful flowers, etc. and I enjoyed walking through the indoor meadow. One of my favorite parts was the umbrellas, painted as flowers, hanging upside down from the ceiling. Something about the light, the carosel, the atmosphere was just fantastic. It was crowded but definitely a place that I will visit again – the next time I go to Vegas. I found this picture this morning when I was looking for a way to be motivated before heading to work. I’m hoping that it will give me the needed engery to get through the day. Lots of things on my To Do list today and plans for the evening so I have to get everything done so I don’t have to think about it work when I get home tonight. 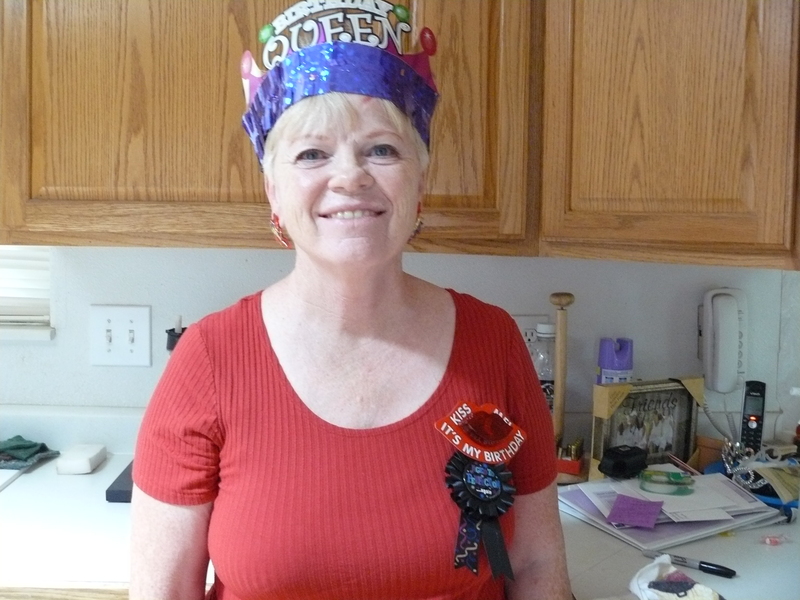 Today I celebrate my best friend and mentor, my mom! She is always encouraging and inspiring in that she never gives up on her dreams. She provides positive feedback and gives me that little push when I’m not taking the next step that I should. Mom shows me the kind of lady that I want to be. She doesn’t take any nonsense from anyone, but is always fair and compassionate. I’m lucky to be close enough to see her every few days and I value all that she does for me every day. There is not another like her and I thank God every day that she is part of my life!